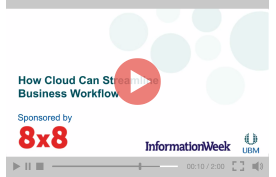 How Cloud Can Streamline Business Workflow | 8x8, Inc.
As the cloud matures, companies will start using it differently, moving from static, high-volume tasks such as ERP or storage to a true integration with the workflow of the business. Improved APIs, maximized scaling, “big memory” and enhanced use of big data will make the cloud more useful and efficient for businesses. In order to optimize your utilization of cloud computing, you need to be able to deliver reliability and scalability while managing workload spikes for a range of applications. 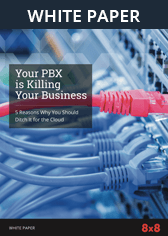 Leveraging the cloud for prioritizing traffic, scaling your applications’ workloads, and streamlining connections between data centres can help you realize those performance goals. In this session, we discuss how to enter the next phase of cloud computing, using cloud services and capabilities to deliver business value across a wide range of applications, including communications and collaboration. Provide greater flexibility as your business changes over time using cloud computing services.